This craft accompanies the Let’s Be Planes! song from Sing and Play Green. 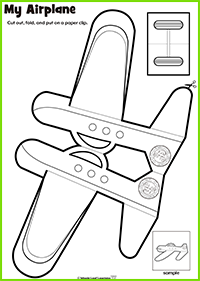 Directions: Color the airplane and cut it out. Fold in half and glue it together. Fold up the front and back wings. Glue the tires on the bottom of the plane. Attach a paper clip to the nose of the plane. Make it fly!